Rainkhan, well known SNG and tournament player, has currently won five World Series of Poker seats already, and we haven't even hit mid April yet. With a full month and a half left before the World Series of Poker gets underway, I would say that there is a great shot that Rainkhan could win 10 seats before all is said and done. To me, playing in these World Series of Poker satellite events is very smart for a good player. They are definitely EV+. Why? Think of all of the lesser players "taking their shot" for a chance at a World Series of Poker seat. In your typical $160 Double Shootout, you are going to half at least half of the field that are scared players, playing above their bankroll. For a good player like Rainkhan who is not afraid of losing, this is definitely a winning proposition. 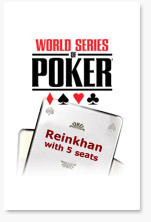 Imagine Rainkhan three-handed for a World Series of Poker seat with two weaker players. Can you say bubble abuse? Considering Rainkhan can just unregister his seat and get $12,000 in T$, this is a very profitable venture and a great way to pad his tournament dollars for the future. I would recommend any strong poker players to play as many of these World Series of Poker satellites as humanly possible. They are certainly EV+.